For our very large events please scroll to the bottom of the page for links to specific areas. Here are more general, local and community events. 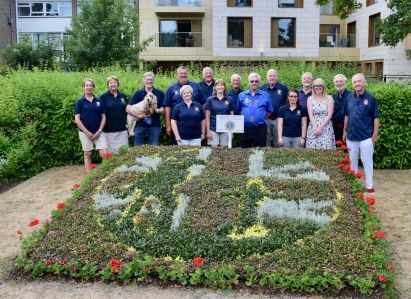 Farnham Lions are delighted to have again sponsored the flower bed in Gostrey Meadows surrounding the war memorial. 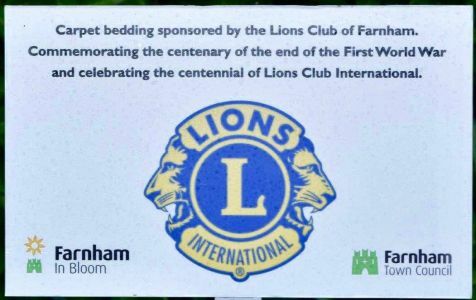 This year the bedding both commemorates the centenary of the end of World War 1, and also celebrates the centenary of Lions Clubs International and 100 years of service to their local communities around the world. After many months work, all of the fabulous 44 otters that formed the Otter Wey Trail for the 2017-18 Farnham Town Council Mayor's charity, were gathered together and all appeared at Gostrey Fayre on Farnham Carnival day - Saturday 30th June. There was amazing interest in them and on Monday 9th July they were all taken to at Farnham Castle for a live auction hosted by the Castle, sponsored by Kidd Rapinet and conducted by Bonhams auctioneer Sholto Gilbertson. And after all the counting and a small top up from the Towns Xmas concert donations, on 18th September our Immediate Past Mayor Mike Hodge was delighted to present cheques totalling £30,000 to the two beneficiaries. A truly amazing total, and our thanks to all who contributed and made the project such a success. If you haven't heard of the Otter Wey Trail take a look at the project - just Click here. We are delighted to announce the winner of the Otter Wey Trail competition. The winner is George K (full name withheld). The otter was presented at the live auction on Monday 9th July. Farnham's Town Clerk has advised us that the Otter Wey trail had more entries than any other Farnham Trail in our towns history. A tribute we think to the quality of the work and our community. We are also delighted to announce that the most popular community otter receiving more votes than any other at the Gostrey Fayre was Otter number 31, created and decorated by Folly Hill Infants School. This otter wins the title of "Best Community Otter." Farnham Lions and our friends in the community, The Hedgehogs, as well as a few independent contributors all worked incredibly hard to deliver the 2018 Farnham Carnival Parade and Fayre - and from the comments received one of the best ever. The stalls in the Fayre were sold out and the parade was excellent. As always we also desperately need volunteers to help to marshall the parade, so please if you enjoyed this year - get in touch and offer your support perhaps to help next year. Its just three hours of your time from 5pm - 8pm on Saturday 29th June 2019 and you get the best possible views of the parade.... If you would like to sign up to help please just go to the Contact us page and let us know your details - we would be delighted to hear from you. For all details about carnival go to the separate Carnival website. We will be updating photos and letting you know the theme for next year very soon once we are recovered from the weekend. For our very large events click on any event to go directly to the archive page.